In this small book, based on commentary given by Rudolf Steiner (1861-1925) as well as his own intensive work with many groups, Joop van Dam has created a practical guide for anyone wishing to take up this path of personal development. 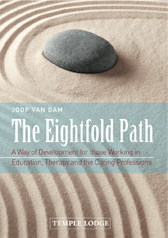 He gives particular focus to the benefit that can be gained from the Eightfold Path by those in the educational, therapeutic and caring professions. JOOP VAN DAM was a Medical Doctor for 40 years in Haarlem, the Netherlands. Now retired, he is still active as a lecturer in educational and medical programmes and in the Anthroposophical Society in the Netherlands, of which he was President for seven years. He is the author of several publications, including The Sixfold Path.